Starts everyday from 1 April to 30 June & 1 September to 31 October. Availability subject to vacancies in accommodation. 7 nights, 6 days independent walking from Mercantour National Park to Menton. Varied walking through a changing landscape from the Mercantour Alps to the Mediterranean coast. 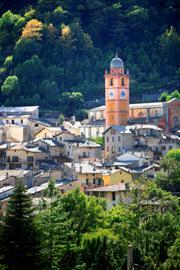 Beautiful perched alpine villages, with a rich historic and cultural heritage with origins in their Italian past. 7 nights in 2 & 3 star hotels and guest houses in double/twin en-suite rooms. A mix of styles of hotels. Evening meals in hotels serving tasty local cuisine. This independent walking holiday in France follows an extraordinary trail from the alpine mountains of the Mercantour National Park to the elegant Mediterranean town of Menton. Your trail passes through a number of delightful perched villages, full of charm with plenty of cultural and historical interest. They have a shared history with Italy which is evident in the architecture. The Mercantour National Park is influenced both by the altitude of its high mountains and the heat and dryness of the Mediterranean. Indeed, it is the only French National Park which has all the different habitats from Mediterranean to alpine in character. Your 6 day walking tour will take you from the rocks and high altitude pastures of the Mercantour through dense forests in narrow valleys and picturesque gorges, passing by historic villages clinging to steep mountainsides. On the Mediterranean coast, the mountains plunge directly into the deep azur blue sea. Enjoy the amazing contrasts of the Cote d'Azur: it's wild and rocky coastline, the pretty colourful fishing ports, the historic old town at Menton. This self-guided walking holiday in southern France for the most part takes place in upland or mountainous areas. The paths are well maintained. They pass through a range of types of terrain underfoot including mountainous. The walking days average about 5hrs 30. Maximum amount of ascent in a day is 860m, average is 500m. The difficulty can be reduced on a few of the days by taking public transport for certain sections. In general the walking days become easier as the holiday progresses and is well within the grade. This walking holiday would be suitable for those walkers used to mountain walking, as well as those more occasional walkers who are in good health and fitness. Your walking trail will take you through a succession of delightful isolated villages built from dry local stone with slate roofs, including Fontan, a village with an architectural style that is unique in the region. The walk or shuttle bus to Saorge, a fascinating and charming village clinging to the steep mountain sides which will leave you staring in amazement. Dinner and night at guest house in Saorge. Discover the alleyways of Saorge, without doubt the most beautiful perched village of the region with its historic baroque monastary and chapel. Your walking route to Breil sur Roya follows the "salt trail". This is a short and beautiful section with some steeper sections. At Breil-sur-Roya in the valley bottom you can enjoy looking around its lovely historic buidlings and monuments. A beautiful path through delightful landscapes which leads you through the well preserved perched village of Peine-Haute and an isolated chapel surrounded by olive groves, as well as a series of gorges, with one foot in France and the other in Italy. Dinner and night in hotel at Sospel. Chance to explore Sospel with the remains of its fortified chateau, cathedral and a number of other historic buildings recalling the importance of this settlement over the centuries. Your interesting walking trail takes you to the village of Sainte-Agnès, where it's already possible to see the Mediterranean. Dinner and night in hotel at Sainte-Agnès. You have the option of reducing your walking trail by taking a bus service to Castillon. Today you'll arrive at the historic old town of Menton, perched on the slopes above its port. You have the choice between two walking trails either via the delightful historic villages of Gorbio and Roquebrune before reaching the Mediterranean coast and walking around Cap Martin, or via the hilltop village of Casteller on a wonderful balcony trail. Night in hotel at Menton. End of your independent walking holiday after breakfast. Saint Yves, St Agnes Hotel Located in the village of Sainte-Agnes, 800m above sea level. Great views from the hotel and terrace over the Mediterranean. Eurostar, TGV and TER French trains allow access to St-Dalmas-de-Tende. Your first hotel is a five minute walk from the train station. From the UK, changes between the Eurostar and TGV are at Lille or Paris. TGV's run from Paris to Nice direct or via Lyon or Toulon. Change at Nice to take the line Nice-Cuneo and descend at St-Dalmas-de-Tende. 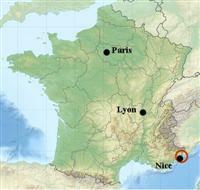 There are flights from French and UK airports to Nice Cote d'Azur airport. Operators from UK airports include Flybe, Easyjet and British Airways. Aéroport International Nice-Côte d'Azur is located 7km from the city centre. A taxi service runs from the airport to the city centre and takes approximately 20 minutes. Alternatively you can take a 10-15 minute bus journey from the airport to the town centre which runs every 30 minutes. The SNCF station is close to the town centre. The main car hire firms are present at Nice Airport. Note: Please check concerning the availability of a holiday before booking any flights. If you need further information or would like to discuss any aspect of your travel arrangements, please contact us, we’re here to help you. Channel ferry crossings from Dover are provided by a number of operators including P&O Ferries & DFDS seaways. Crossings are also provided by train with Eurotunnel. Once in France, the journey from Calais to Saint-Dalmas-de-Tende takes about 12-13 hours (excluding long breaks). There is a car park at your hotel. From Nice take the motorway towards Vintimille, then the RN204, Vallée de la Roya, direction Col de Tende. On the way you'll pass through Breil-sur-Roya, Fontan before reaching Saint-Dalmas-de-Tende. Your car can be left here during the holiday - non secured. Train back from Nice using the Nice - Cuneo line.